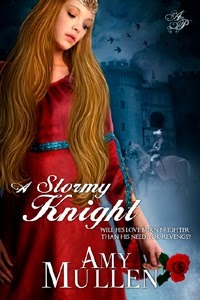 Today, I have fellow Astraea Press author, Amy Mullen, for an interview and spotlight on her Medieval romance, A Stormy Knight. For me, it is doing something I have always loved to do. In the same way that I can shut out the world when reading a good book, I can escape somewhere else when writing – but I can pick where I go or what the characters will do. I think it is just doing it. I love to do to it but it can be painful. I know that does not make any sense, but it’s true. I read once that someone said they loved ‘having written’ and I can certainly understand what they meant. A Stormy Knight is a medieval romance, and another in the final stages of editing called Redefining Rayne is the same. I love the time period. However, I have what I hope is a great idea for a contemporary. I may tackle that next. I also am working on a sequel to my first. I change my mind every day on which I want to go for next. Oh, just about everything. I have learned that commas are hard and no two people agree on where they do and do not go, and also that characters should pull a plot rather than the other way around. I have also learned how much language has evolved. A lot of the words we use today were not used in the medieval time period, which means I have to be very careful about phrases and modern words. I only have two thus far and I love them both. I might have to lean towards Rayne in my upcoming release. This poor girl has been put through the grinder and still finds a reason to get up in the morning. I think we all have days or even months like that. She hangs in there when I’m not even sure I would have. I think I like the wounded-alpha. Is there such a thing? I like a strong, sure hero but at the same time, he’s got to have some flaws. 7. Tell us about your journey in writing this book. For A Stormy Knight I just set out to write a good book. It was a test to see if I could. It took me a long time to write it and I realized how hard and rewarding writing a novel can be. 8. Tell us three quirky or interesting things about yourself. I love the Wiggles, I have the worst singing voice in the world but I sing to my kids sometimes instead of raising my voice, and I cry over a commercial, video, or random event at least once a day. 9. What rituals do you use to help you focus or get the words down on the page e.g. music or a snack. Sometimes I watch a TV series, but I rarely listen to music. I just make sure I have a drink (preferably Coke Zero or decaf coffee) next to me. I will get up and pace back and forth when I’m thinking hard or stuck. Chocolate helps a LOT during edits! 10. Mention something unique about your books and your writing style. I don’t know if it would be unique, but I often find, once completed, a story has helped me work out an issue in my own life. I do not do it on purpose and my characters are not modelled on people I know. I always find something of myself or my life nestled in there. I think it can be healing to work things out that way when there are no real life answers or resolutions. 11. What book would you like to work on next? Well, I’m a football fan. I get a little nutty when I’m watching football (Go Bills!). I recently went to my first live NFL game and was inspired. I think a football themed contemporary may be in my near future. I also plan to write a sequel to A Stormy Knight soon. "You defy me," he said as he spun around to face her, "and you do it at every opportunity. You have caused me great pain, and I will have no more of it. You lead my men astray and cause them to be weak. I cannot be lord with you undermining my authority within these walls!" Gemma steadied her voice, her only option clear, "I shall leave then. I will go to my uncle in Wales. We shall remain married. There is nothing that can change that, so your hold on this land is secure. 'Tis all you care for. I once loved it here, but living with a man who does not know how to trust me is too much to bear." "You are my wife, like it or hate it, and you will do as you are told! You will stay out of my way, and you will not step foot outside of the keep until I say so." His entire body was tense, his voice harsh. "Nay," she said while lifting her chin, "I shall leave. What you do not know, Nicholas de Reymes, is that I love you." "And because of that love" she continued, tears falling in earnest, "I can no longer abide this life. For the second time, loving you has been a mistake. My feelings betray me, and they anger you. I will be gone before I cause you more pain. I will take Isabel with me, and my father can come when he is up to travel. All I ask is you treat him well in my absence." Thank you so much, Amy. Your book sounds fascinating. I love that era, too. Adored your answers. Quite a few of my books have helped me through something, too. And I also cry at the drop of a hat. Any movie or story that touches me makes me cry. And wink, wink, decaf coffee is still the best! Go for it with your sports romance. They are great fun to write. Wishing you all the best. Hi Cathrina. Thank you so much for thinking of me. I'd like to take part but have done this so many times, I don't have anyone else to tag. Great interview. Setting out to write a great book will often times lead you there. Congratulations.